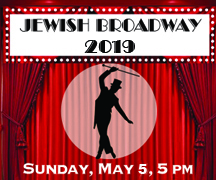 Broadway comes to Boulder yet again at Congregation Nevei Kodesh, Boulder’s vibrant Jewish Renewal community! Our exciting and fun evening includes live performances of Broadway hits by over two dozen entertainers, dinner and silent/live auction. Our Online Auction will be open until 7 pm Sunday, May 5. You need not attend the event to win items. Some items will be available at event only. Click here for auction, details and ticket sales.